"A significant hurdle for formulating and implementing policy to address the needs of this uniquely vulnerable workforce [of women day laborers] is the lack of data on workplace issues and on the dynamics of informal hiring sites. A goal of this case study of women day laborers is to address the gap in the existing research by examining the range of issues facing women day laborers who seek employment at the Brooklyn hiring site." Since the spring of 2015, The Worker Institute at Cornell in partnership with community-based worker organizations has formed a research collaborative on day laborers. This initiative involves research and technical assistance efforts to collect data on working conditions of day laborers in the New York metropolitan area, and to develop innovative social media tools for the prevention of wage theft and other labor rights violations. As part of this broader initiative, The Worker Institute, Worker's Justice Project, and Jews for Racial and Economic Justice partnered to produce this report focused on the working conditions and unique vulnerabilities of women day laborers. A worker center (or job center) should be established at this specific site to provide basic facilities, including bathrooms and shelter from the elements; and to provide a space for both workers and employers to achieve mutually beneficial employment contracts. A code of conduct for private household and commercial employers should be created to promote fair employment practices and clearly outline the essential responsibilities of the employer to meet certain standards of workplace conditions for women day laborers. Employer educational programs should be developed in collaboration with community and religious leaders. Such programs for both private household and commercial employers will serve the purpose of increasing awareness about the need for protective equipment and safety standards for women day laborers in all types of work. Workforce development opportunities should be provided to help build a career path and promote more stable employment for women day laborers in housekeeping, construction, and related sectors. Local policies encouraging green cleaning practices, as well as the creation of certification or licensing programs should be explored as part of a broader educational and skill upgrading initiative. An in-depth analysis of the legal framework should be conducted to inform policymakers of the lack of legal protections for day laborers working as housekeepers in private households. The analysis should provide recommendations for amendments to existing laws and passage of new laws where appropriate. The New York State Domestic Worker Bill of Rights does not apply when domestic work is performed on a casual basis, which is the predominant form of employment for the women day laborers who seek work at the Brooklyn site. Safety and health regulations and enforcement mechanisms should be developed for domestic work, including housekeeping. Domestic workers are expressly excluded from coverage by the Occupational Safety and Health Act when they work in a private household. Under the current laws, the women day laborers would be protected only if an employment agency or a cleaning contractor employed them. A registry of private household employers, as part of the community code of conduct mentioned above, can be an important step towards formalizing the employee-employer relations and promoting fair labor practices. In addition, new public policy initiatives should be explored to determine how to foster formal employment relations (as opposed to informal economy employment) for the domestic work industry generally, and for domestic day laborers in particular. Such new policies should be designed such that they do not create an onerous process that would discourage private household employers from hiring day laborers. 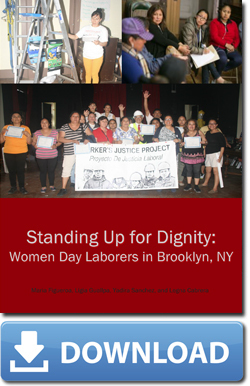 For details on each recommendation, please download the full report Standing Up for Dignity: Women Day Laborers in Brooklyn, NY (PDF, 1.7 MB). This initiative is possible because of the support of the State of New York and funding from the Worker Institute at Cornell, and from Workers’ Justice Project. The opinions, findings and/or inerpretations of data contained herein are the responsibility of the authors and do not necessarily represent the opinions, interpretations or policy of the State of New York or of the ILR School, Cornell University.